Social Technologies Summit Futuresonic is international festival trying to answer questions of tomorrow: how will we interact with each other and nature around us in future. Futuresonic festivals fringe at Arcspace in St. Wilfrid’s Enterprise Center answered the question trough its grassroots movement created events that hosted, among many other events, CultureRobot installation. 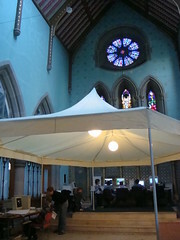 Arcspace is situated in ex-church building that is turned into St. Wilfrid’s Enterprise Center since 1992 – a unique architecture where insides of the church are transformed into enterprise center for ethical businesses and NGOs. St. Wilfrid’s Enterprise Center is situated in Hulme, an area near to Manchester city center. Hulme was mapped not only as a territory but also as a specific part of the city with vibrant activist community and a history. ArcSpace was visited by people of different age and heterogeneous needs and activities, exchanging their beliefs, stories and producing new possibilities for exchange and collaboration in spirit of free culture. Culture Robot installation was created by help of the community from the start to the end. Materials were collected or borrowed instead of purchased or rented, help with programing for interactive part of the installation was done by friends and volunteers, and installation debuted at Saturday on the open, community day, that hosted events inside and outside the Center.CR 3.0 installation created a new relationship between local community and this art piece. More than ever people were active in collecting material, discussing and managing to interconnect installation with other events during Futuresonic fringe. CR 3.0 mapped more than just Hulme, it mapped its people, relationships, how they feel about city development, architecture, organizations working with art and culture in Manchester and how financing is a part of the culture and where does it lead culture to, it showed community strength and grassroots development. During the open days, all ethnic, age, academic and other walks of life were united and exchanged opinions, questions and ideas. Guerrilla busking was happening in the city throughout the day, graffite artists were spraying on the vans and trailers (an identifiable vehicle in the Redbrick’s area of the Hulme – where travelers and free people of all sorts live). People from recycled biodiesel group, local bcycle repair man, drummers, community artists, foreign guests, local volunteers and experts were united to make a truly social event, creating bridges between cultures, people and technology in universal feeling of unity. No. of the piece 6517 is work under name ‘RECording’ applied to internet competition and online festival 2008culturas.com. ‘RECording’ is a video where one can see tourists recording Dubrovnik. GentleJunk is sharing a virtual stage with Julie Rousse on upcoming noplacard festival, Sunday 17th February, 2 o’clock in the morning. noplacard is a mix in between the (((NOMUSIC))) festival and the placard headphone festival that lasts for 24 hours in Paris at la menagerie de verre during the Economie0 event. (((NOMUSIC))) started on June 2001, according to the principle that a diffusion site on Internet should correspond to the representation of the singular performances of a new generation of artists, musicians, performers and other actors of the electronic scene. The creation of this open diffusion site proved to be necessary because of today’s difficulty to perform disembodied concerts of electronic music on stage, in a classical frontal (actor/audience) representation space. Nowadays, these emerging new multimedia performances allow everybody to approach music in a more singular way, with a different listening practice and on a more sharing scene. Manifestacija Operacija grad:Jedinstvo otvara PRIVREMENI ILEGALNI CENTAR ZA KULTURU I MLADE u bivšoj tvornici Jedinstvo na Savskom nasipu u Zagrebu. Tokom manifestacioje održat će se Impronedjeljci (improvizirani experimentalni glazbeni sessioni) i video instalacija TVTurnoffWeek.